Stop those irritating power disconnections with KSC's watertight Cord Lock. Simply close the Cord Connect around each cord end and then twist to lock the cords together. Great for professionals or do-it-yourselfers working with extension cords or power tools. Snap together design makes installation and removal of cords quick and easy - even when wearing work gloves! 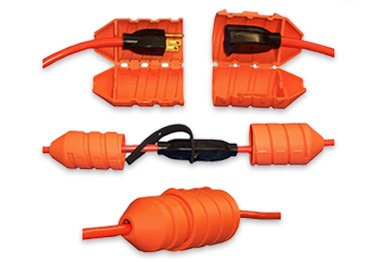 Does the plastic material of the Extension Cord Plug Protector have a UL flammability rating? Can this product be submerged in water? We are looking for something similar that would withstand cars or trucks driving over it when cords are stretched out over a driveway. We use 12/3 cords... Any suggestions ? We bought these to use in the factory, employees were constantly tying their extension cords and we were getting dinged on safety audits. After we started using this the problem is solved. Easy to use and I like the safety orange color! Good product does the job . cause it would get wet at the connections and trip the fuse. BUT, not anymore. These plug protectors keep everything nice and dry. My chickens and I thank you very much. Ordered just what I wanted and it works and fits a normal 12 GA cord perfectly. Is it the best? I don't know, but it does the job. I would reorder if I need more. Delivery was very quick. I rate this product and delivery very high. Just what I needed to make my outdoor Christmas decorations safe. It rained almost the entire month these plug protectors were in use and they worked beautifully. Easy to install and easy to take up. They'll be back in the garden soon! These were just what I needed to light up my outside Christmas tree. They work beautifully. My lights are gorgeous. Thank you so much. Just what I have been looking for and at a great price! I got the green cover to use in my garden. I do not have power out in the yard so I run the pump to my little pond via an exterior rated extension cord plugged inside the garage. I had to be home and always unplugging it whenever the weather turned threatening. Several downpours and high wind storms later it is still working like a charm! So nice to just let the pump run and not worry about shorting everything out. So glad I found this site! I looked for this product for a long time. I had problems with my koi pond pumps tripping the GFI during rainstorms. Thanks to Koffler, I found the solution and the perfect product.